Generally two pairs of wings, although these may be reduced or even absent; forewings have well developed veins and tend to be hardened, they overlap down the mid-dorsal line; membranous hindwings are folded below forewings; long whip-like, many-segmented antennae; omnivorous, with mouth parts adapted for biting; tarsi, 5-segmented; incomplete metamorphosis, with egg and nymph stages. Adults, 20-24mm long; colour, dark-brown, nearly black; wings of male cover two-thirds of abdomen, wings of female are vestigial; can climb rough but not smooth vertical surfaces. The female produces 5 egg capsules at monthly intervals. The thick-walled resistant capsules, 12mm in length, each contain up to 16 eggs and are cemented to the substrate in the vicinity of a food supply. They may then be covered over with debris. Nymphs emerge 6-12 weeks later and progress through 7-10 moults before reaching maturity, a process which takes 10 months-2 years depending upon temperature and food supply. With each successive moult the wings, antennae and cerci develop and the nymph becomes progressively more like the adult. Adults live approximately 4.5 months at 25°C. The slow proliferation of B. orientalis will limit its success where reasonable standards of hygiene exist. Adult, 10-15mm long; colour, yellowish-brown with two longitudinal dark marks on pronotum; wings well developed in both sexes; can readily climb rough and polished vertical surfaces. Small size, therefore readily conceals itself. Adult, 28-44mm long; colour, red-brown with yellow border around pronotum; no yellow submarginal stripes on forewings; last segment of cerci, twice as long as wide. stripe at base of forewings. The nymphs of all species are similar in appearance to the adult but smaller. Immediately after hatching or moulting the nymphs are white, but the cuticle soon darkens to the normal colour. Cockroaches are common in commercial premises associated with the production or handling of food. Also in public buildings and domestic premises eg apartment blocks. Gregarious and nocturnal, they spend the day hiding in cracks and crevices around such areas as sinks, drains, cookers, the backs of cupboards and in refrigerator motor compartments. They especially favour buildings with service ducts and complex plumbing installations. Infestations may be introduced as egg cases or adults in incoming laundry, on raw materials, in crates and packaging, or arise as the insects enter buildings via such routes as drains or refuse chutes. generally prefers warmer, humid environments, e.g. centrally heated buildings, whilst B. orientalisis frequently encountered in cooler, less humid areas such as basements and drains. P. americana and P. australasiae are tropical and sub-tropical species but are also found in ports and shipping areas in temperate climates. mechanical transfer of causative agents of disease from the insect’s body, or by transmission in the faeces. An outbreak of food poisoning in a Brussels hospital subsided immediately an infestation of B. germanica was controlled. 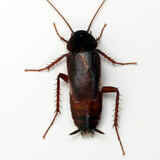 Cockroaches and their faeces may cause allergic reactions especially amongst sensitive individuals eg asthmatics. Exposure may result from ingestion or through the inhalation of materials derived from cockroaches in airborne dust. 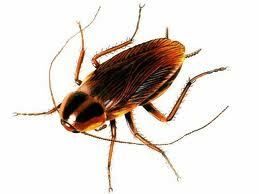 In addition, food may be tainted with the characteristic smell of the cockroach, which is produced by faeces and salivary/abdominal gland secretions, or by the dead insects. – Deny access to food and water. This will increase cockroach activity and directed movement improving the opportunity for the insects to encounter insecticides. – Deny access to harbourages in buildings or equipment which would otherwise provide hiding places, a means of gaining access and dispersing and breeding sites. – Ease of cleaning. Buildings and equipment should be designed to minimise the accumulation of debris and facilitate ease of cleaning. – Surveillance of incoming materials including packaging and laundry. – Environmental controls eg ventilation which will accelerate dehydration of the insects and interfere with the operation of antennal chemoreceptors. the insecticide should ideally persist until all egg cases have hatched but continued immigration may demand routine treatments. Regular treatments are necessary eg at weekly intervals until the infestation is brought under control. Thereafter, maintenance treatments, at less frequent intervals should keep the insect population at an acceptable level. Initially there will be a massive kill of adults and nymphs resulting in only the appearance of young nymphs from time to time. The technique is particularly useful using pyrethroid insecticides to flush cockroaches from their harbourages and over surface deposits of insecticide. Baits offer the opportunity for controlled placement of insecticides formulated in attractive food bases. When placed in areas infested with cockroaches the insects feed on the baits picking up a lethal dose of insecticide in the process. By using baits its possible to offer continuous control of cockroaches over extended periods. Baits can be used in conjunction with surface and space spray treatments.